Decorative patterns – on subway seats, office carpets and bedclothes – are often designed to disguise the residue of human presence. A pattern’s matrix can quietly accept a stain as if it belongs there. The natural life of abstract motifs was a primary visual theme in Dan Gunn’s solo exhibition at Monique Meloche Gallery. Gunn makes great use of lattices, weavings, zigzags, accordion folds, repeating lozenges, chevrons and vertical and horizontal bands as both the structure and form of his sculptures. He paints these sculptures by staining and distressing them with his marks. Gunn’s pleasant, mellow abstractions call up a golden age of Modernism, specifically Weimar-era Bauhaus, as if he were a late pupil of Paul Klee and Anni Albers. His sculptures demonstrate that the lessons of the Bauhaus are relevant today and can be learned anew, allowing geometry, chromatics and design to intersect easily without worry of genre contamination. Dialog Equipment (all works 2011) is a paint-scuffed blackboard, in a dark wood frame, propped on lathed table legs and leaning against the wall, exhaling after a long lecture. The work displays a lived-in quality, as if recovered from art history’s secret attic. 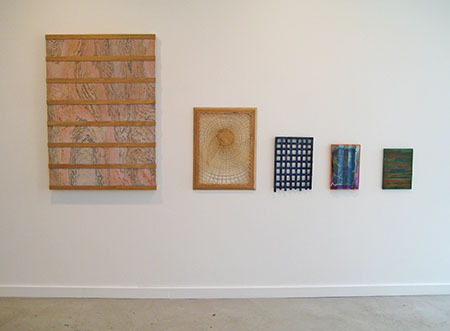 Recent conversations about Gunn’s objects have revolved around the expanded practice of conceptual painting. This association may be isolating, as many of Gunn’s objects seem just a few hinges and planes away from becoming something functional. They comfortably reference textiles, interior architecture and handmade furniture. Twelve of the 14 works in the exhibition were placed on wooden supports, have wooden artist’s frames, or are simply, integrally, wood sculpture and wood relief. Sometimes the woodgrain pattern is traced by colored pencil and acrylic, as are edges, joins, and cuts, like a direct frottage, emanating a warm nostalgia, as if Gunn were refurbishing an old structure from salvaged memories. If there is a lineage of domestic-type objects digested by the subconscious, one can place Gunn following Richards Artschwager, Rezac and Tuttle. Architectural Play Instrument No. 1 and No. 2 were two tall screens that each zigzagged, in eight switchbacks laced with latticed wood slats, near the gallery’s entrance and across a large window. The screens were an attempt to delimit a special, private space. Many of the structural patterns in the show, including the folding screens, are innately contained and coiled, leading out of and meandering back into themselves. Words such as ‘mystery’ and ‘enchantment’ figure in to some of the object titles, suggesting deep interiority. A 2008 installation, Territory, is the most literal manifestation of this search to claim a corner of the world. With collaborator Karolina Gnatowski, Gunn built a soft fort within their home and turned a living room into shadowy forest, creating intimate fantasy spaces from which to daydream alternatives to the everyday, embodied by the domestic built environment. Since Territory, Gunn has made it a point to exhibit in several other domestic spaces that operate as exhibition venues, and his essay ‘Notes on Apartment Culture’ (2009) is a call to artists and apartment renters to continue the anti-institutional tradition of handmade gallery spaces within homes, despite, and because of, their mutability and fleetingness, like so many layers of a landlord’s whitewash. To this end, Gunn’s objects symbolically reference material culture, a field that considers how objects made by craftsmen have meaningful social and personal implications. From the wood screens to the woven caning to the altered prefabricated oak panel, Gunn’s objects evoke a sensate familiarity with culturally wedded materials, and they welcome anthropological inquiries in addition to art-historical ones. Like the artists of the Bauhaus, Gunn posits that abstraction is not disruptive to daily life. Rather, abstraction lets the world into itself, permeating previously assumed rigidities. A blue-tinted Perspex mobile, Crystalline Curtain No. 3, hung against the window like a transparent drape. It effectively pictured the passing world through itself, coloured it blue, prompting one to seek and see mystery in the familiar.